near Lanesboro, MN. On the Root River. Thursday, May 9: Early Arrival (optional). Folks like to come down Thursday night to hang out and fish. Plus, they can be ready for the river float that happens on Friday, which is a hard thing to get to if you're leaving Friday. Optional. Friday, May 10, Noon (approximately): Float Trip (optional). Meet at the roughfish.com flags in the campground! Float Trip on the Root River! This is a tradition. The early arrivals (and anybody who can get to the campground by noon on Friday!) will carpool with boats up the dam in downtown Lanesboro on the South Fork. This is a beautiful canoe or kayak trip through historic Lanesboro, back down to the campground. There may or may not be some rapids and rocks, so if you're new to canoing or kayaking it's a good idea to have an experienced partner and/or someone within earshot in the heavy water, depending on the water level. Please arrange for a boat to ride in before the roundup! You can rent boats from the campground if necessary. Friday, May 10, Evening: Meet and greet (optional). Drink a beer, fish the mighty Root River, cook some fish, or tell lies around a campfire. This all starts when the early arrivals start showing up in the campground by boat! It's a magical time. The folks floating the river love to get a shout-out from people fishing or hanging out on the shore! If you see a floater, be sure to yell "Who are you?" at them - they are legally required to give you their name and handle. Many of the floaters end up soaked to the skin, freezing cold and/or sunburned, bruised, and possibly brain-damaged, so any help is appreciated. This is a great evening to swap stories with your fellow roughfishers. 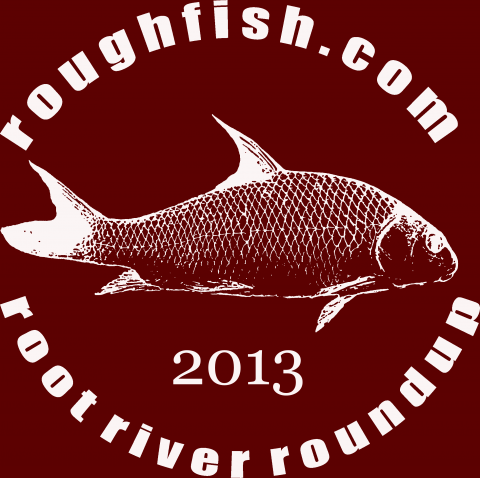 Please pay for your roughfish.com shirts Friday if possible! Saturday, May 11, 11:00 am: Registration for the species derby. The derby costs nothing, but you must register and pick up a nametag under the roughfish.com flags to participate. Donated prizes will be placed on the Prize Table, near the roughfish.com flags. Saturday, May 11, 11:59 am: Early fisherman stampede. Derby participants who are wearing the roughfish.com 2013 T-shirt (and get a 1-minute bonus time) can head for the river like a herd of enraged bison. Saturday, May 11, 12:00 (noon): 2013 Species Derby begins! Catch as many species as possible during the next three hours to win the ultimate prize! You must have a digital camera. To record a species caught, take a clear, incontivertible photograoh of the fish, including your species-derby nametag! Your total score is the count of every species of fish you catch and document with a digital photograph during the species derby. Saturday, May 11, 3:00: 2013 Species Derby Judging begins. Judges Andy and Corey Geving (and any other designated judges) will adjudicate the contest results and declare a winner (or a tie). If the species derby results in a tie, the roudup goes into SUDDEN DEATH MODE. Sudden Death Mode rules will be announced when or if it occurs. Just be aware, it can be very intense and nobody wants to go into sudden death fishing mode. If there is a clear winner, prizes are awarded immediately. Saturday, May 11, 4:00: 2013 Species Derby Prize Awards. Judge Corey will award prizes. Every angler will get to pick a prize , in order of ahievement, until all of the prizes are gone. 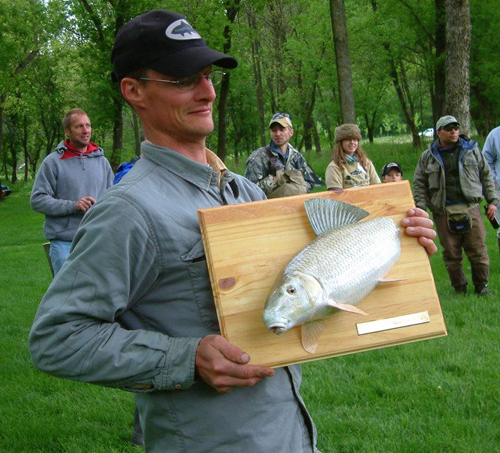 Prize awards are done in a round-robin, with all anglers ranked and picking prizes in order of number of species caught. Usually, most people who catch at least one fish during the three-hour contest get to choose a prize of some kind. There will be at least one awesome deer-antler bankstick as a prize, but it will probably not last long! Saturday, May 11, 6:00: Fish Fry (optional, but come on! ): We'll cook up some delicious Root River fish. The format is potluck - in other words, we'd appreciate it if you'd bring some kind of food or something, but we're not organized enough to tell you what to bring. Corey and The Frymaster and The Frymaster's Dog will grind, fry, and serve delicious sucker balls. These are fish cakes made with fresh-caught Root River Redhorse. They are dellicious, and we will try very hard to cook enough for everybody! A bunch of other food may or may not be available. Saturday, May 11, evening: Campfires, more hanging out, and NIGHT FISHING (optional). People who wish to fish for sturgeon, catfish, or just get away from the campground and spend time on the riverbank can head for the river for some night fishing. There may or may not be live improv campfire music, this may or may not include a frog. And that's it. Please, add more info in the comments and I'll amend this post!